In 1927, Unzen was ranked 1st in the mountain category for the New Eight Views of Japan, and in 1934 was designated as our country's first national park. 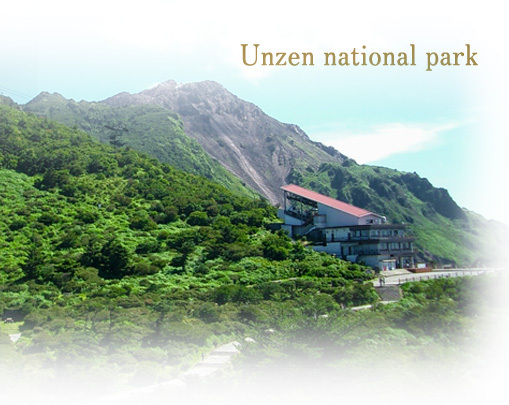 Unzen's nature has been preciously preserved since days of old, and is an encyclopedia of nature. Unzen Jigoku, an attraction characteristic of Unzen. 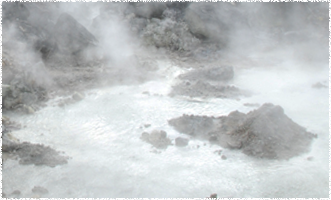 High-temperature hot springs and gasses erupt violently from everywhere, and with the strong smell of sulfur, the steamy scenery evokes a vision of hell. 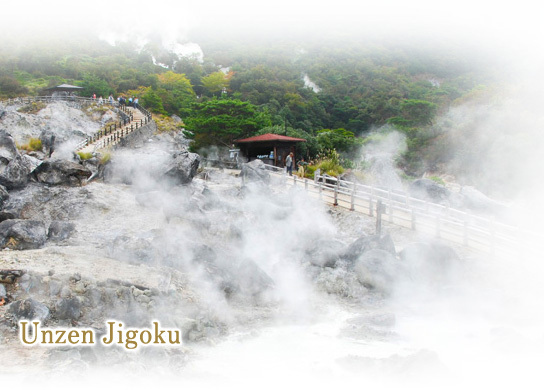 There are around 30 geothermal fields, such as “Oito Jigoku”, and “Daikyoukan Jigoku”. 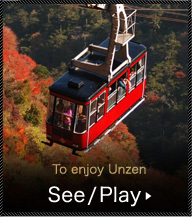 Recommendation contents Please enjoy your stay at Unzen with plans to suit your needs. 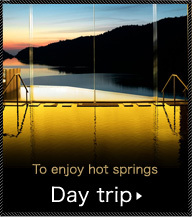 You can enjoy the changing scenery of the four seasons from any hotel or inn. 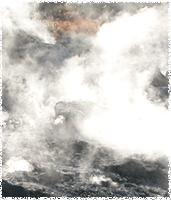 Once wrapped in the atmospheric white steam, the fatigue from your journey will be soothed away. From Nagasaki airport, please use the bus. Please switch to the Shimatetsu Bus from Isahaya terminal, and get off at the Shimatetsu Bus Unzen office. Furthermore, if you are coming from Kumamoto prefecture, the ferry that connects Kumamoto prefecture and Shimabara in Nagasaki prefecture is close and convenient. It is only 30 minutes from Kumamoto new port to Shimabara outport. From Fukuoka airport to Unzen, please transfer to the bus from the JR Isahaya station. From Haneda Airport to the Nagasaki Airport … about 100min. From Itami Airport to the Nagasaki Airport … about 80min. From Kansai international Airport to the Nagasaki Airport … about 80min. From Kobe Airport to the Nagasaki Airport … about 70min. From Chubu centrair international Airport to the Nagasaki Airport … about 80min. From Okinawa Airport to the Nagasaki Airport … about 90min. From Shanghai to the Nagasaki Airport … about 90min. From Seoul to the Nagasaki Airport … about 90min. From Nagasaki airport to Isahaya terminal in the case of prefectural Bus … about 45min. From Nagasaki airport to Isahaya terminal in the case of Shimatetsu Bus … about 30min. From Isahaya terminal to Shimatetsu Bus Unzen office … about 80min. From Kumamoto new port to Shimabara outport in the case of Kumamoto Ferry … about 30min. From Kumamoto new port to Shimabara outport in the case of Kyusho Ferry … about 60min. From Shimabara outport, it is only approximately 30 minutes by car to Unzen hot springs.